How Do You Use Division with Negative Numbers to Solve an Inequality Word Problem? How Do You Figure Out the Sign of a Product or Quotient? Multiplying and dividing numbers takes a good amount of thinking, and it's easy to make a mistake. But you can make sure that you're on the right track if you check whether the answer should be positive or negative. In this tutorial you'll see exactly how to tell if your answer will be positive or negative, even if you don't know the exact value of the answer. That way you'll always be able to check your answers! What's the Division Property of Inequality? Ever wondered what rules you're allowed to follow when you're working with inequalities? Well, one of those rules is called the division property of inequality, and it basically says that if you divide one side of an inequality by a number, you can divide the other side of the inequality by the same number. However, you have to be very careful about the direction of the inequality! Watch the tutorial to see how this looks in terms of algebra! 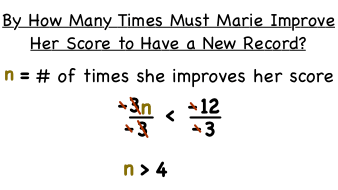 How Do You Use Multiplication with Negative Numbers to Solve an Inequality Word Problem? How Do You Use Division with Positive Numbers to Solve an Inequality Word Problem?